The RoboFlow add-on is for automated digital asset routing, metadata processing and project communications. It was built specifically to work with the features and functionality of Cumulus and to extend the range of Cumulus to access third-party applications to process files, or to collect and collate information. Make CMS and website management easier by letting RoboFlow deliver files where they’re needed, using naming conventions you define. • Keep Cumulus catalogs in sync with file folders, and more. export files at intervals you define and you can create standard text files, XML and SQL-ready records too. Content coming into your organisation will mature as it passes through various levels of usage/adoption and during this time you will want to provide access to it that reflects its current status. For example, new uploads should first be quarantined until checked for suitability and then released for consumption. Older content that has passed its expiry date should no longer be accessible. While these tasks can be performed manually, with RoboFlow, asset lifecycle management can be fully automated. 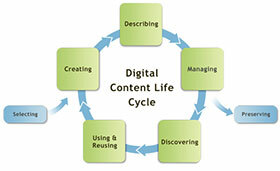 Asset lifecycles will vary based upon the type of content, so for example work-in-progress files should never go into circulation for general access. Instead only the final output as approved by the designated stakeholders is what should be released. Users who work in PowerPoint, InDesign, or other production applications don’t need to worry whether their project’s files will make it into the Cumulus public portal by mistake. RoboFlow synchronises Cumulus catalogs with file folders and ftp sites. This enables users to work with files directly, without needing to manually update Cumulus or even have Cumulus accounts, so changes made outside Cumulus are reflected in your catalogs. When files are added, moved, renamed, deleted or modified, Cumulus users see the changes. Likewise, when asset records are changed from inside Cumulus, RoboFlow updates the corresponding folders accordingly. All Canto RoboFlow workflows are configured using a graphical UI that keeps things simple. The tight integration between Cumulus and RoboFlow means end users never have anything new to learn. RoboFlow can be configured to ignore certain file types or specific folders, ensuring Cumulus catalogs remain clutter free. File naming conventions can be used to direct RoboFlow. This enables users to add “temp” or other flags to the names of files that aren’t ready to be catalogued. RoboFlow uses file names to determine file destinations and processing options. For example, .mov files will always be added to a video catalog, and files of one customer will be kept out of the catalog of another. Integrity checks on metadata fields can be run periodically to flag records that have values out of bounds or are invalid. RoboFlow understands a basic scripting language that includes variables. This means, for example, a RoboFlow workflow can reference the current date or time, or even a given metadata value. Combined with basic math and control structure routing, the RoboFlow scripting language enables you to build file names or metadata values based on system and other variables. This makes the curation of content easier. Much of the description information that you would like to assign to assets might already be contained within your existing systems, like inventory or accounting systems. By integrating with other sources, the time to add the relevant metadata to content can be significantly reduced. How the content is structured, for example folder or file names, might also be useful if extracted automatically and applied to the search tags for an asset. RoboFlow manages scheduled metadata input, ensuring metadata values are always current with dynamic field population. External systems can refresh the metadata inside Cumulus. RoboFlow automatically catalogs the images, extracts the folder names and places them in appropriate metadata fields. Users can be sent alerts, notifications and reports. With RoboFlow, content can be tracked and alerts/notifications can be targeted to appropriate recipients when the asset status changes. This often forms an intrinsic part of production and approval workflows. With RoboFlow more extensive / customised reporting can be implemented. Your organisation might have a particular need to track content based upon various characteristics and desired outcomes of your business operations. Do you have enough product images to go to the next month’s catalog or do you need to get more? Links to relevant assets are included, which helps keep production and approval workflows in motion. Use Case 1 – Uses RoboFlow with their Cumulus DAM to streamline the approval process. The new uploads pass through a RoboFlow workflow approval process: selected members of the organisation are notified of the newly uploaded assets, who can then either approve assets for download or check on authorisation. Use Case 2 – Uses a RoboFlow workflow to synchronise updates to their products from their JDEdwards ERP. Use Case 3 – Uses RoboFlow to rename assets to make them unique before users fill in the relevant metadata and approve the record for general use, or before permission templates are applied on them. Use Case 4 – Uses RoboFlow to periodically synchronise the metadata for assets that exist in their database with another system and export metadata out in an XML file. Use Case 5 – Uses RoboFlow to convert videos to mp4 and add watermark. Use Case 6 – Uses RoboFlow to generate emails about assets downloaded in the last month.